Little is 2 years old and Littlest is 2 months, and both are the sickest they’ve ever been. Christmas Day it started, Little had a cough and sore throat. By that night he was throwing up and running a mild fever. By night two he could hardly breath from all the congestion and Littlest was headed full swing down the same flu path. It’s 6am as I write this on day three, and I’m here to share how we are coping with this plague flu. At the first sign of congestion, my husband busts out the humidifier. We have the Vicks Deluxe Ultrasonic Humidifier . We live in Calgary Alberta, where the air is notoriously dry and this humidifier does a great job in our kids bedroom. 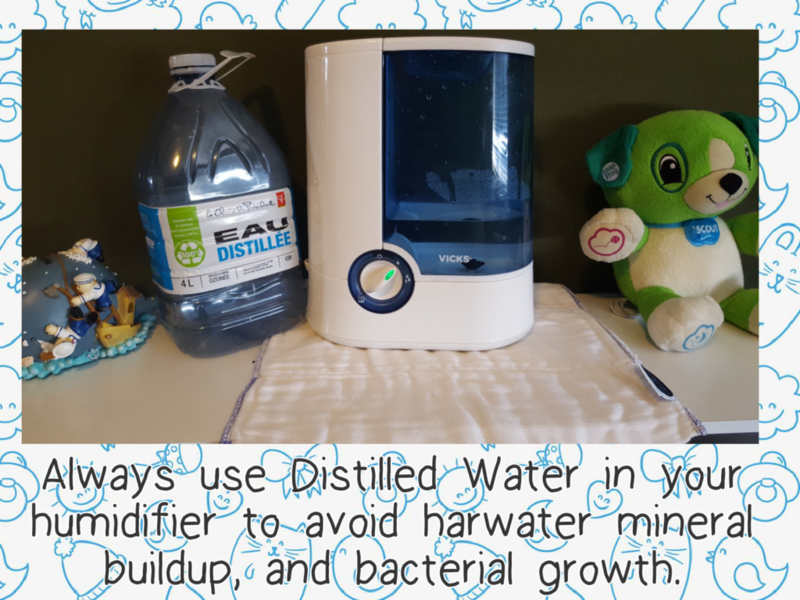 Be sure to only use distilled water in your humidifer, because tapwater contains hard minerals that build up inside your machine. We buy a bottle of distilled water from the pharmacy whenever we know we need to run our humidifier and keep the jug next to it on the shelf. Also, prefold diaper use #3255: makes a great drip catcher for middle of the night refills if needed! The most beneficial aspect of this classic flu remedy is that it works for all ages! Simply place the humidifier in the bedroom of whomever is sick and it does its job overnight. 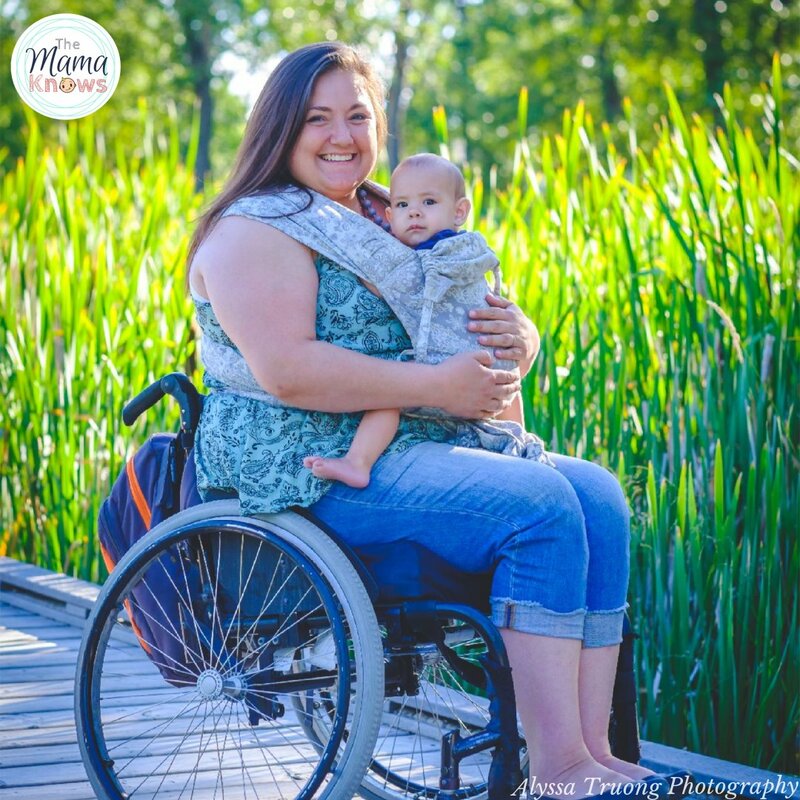 It is especially helpful with newborns and babies, who are limited in what they can take in forms of medicine. At the first stage of congestion, Littlest started to get anxious because, at only 11 weeks old, this was a new and scary feeling for him. I quickly pulled off his sleeper, and my own shirt, and wrapped him snuggly against me in my Fidella Fly Tai carrier. 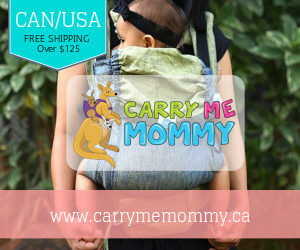 I love this adjustable mei ta carrier because it has given us the best and most secure fit since birth. I bought my Baby Size Fidella Fly Tai at Lagoon Baby. Skin to skin benefits extend beyond the Golden Hour (those first moments after birth). 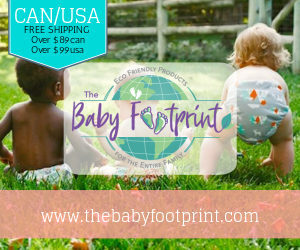 By placing your bare baby against your bare chest you can help regulate their body temperature as well as breathing, heart rate and sugar levels. Skin to skin also calms the baby so he doesn’t get stressed out and cries less. Bonus? Dads can do this too. It’s a great way for dad to bond and feel supportive of Littlest when he’s feeling sick. Here’s a pic of my husband with Littlest on his chest. 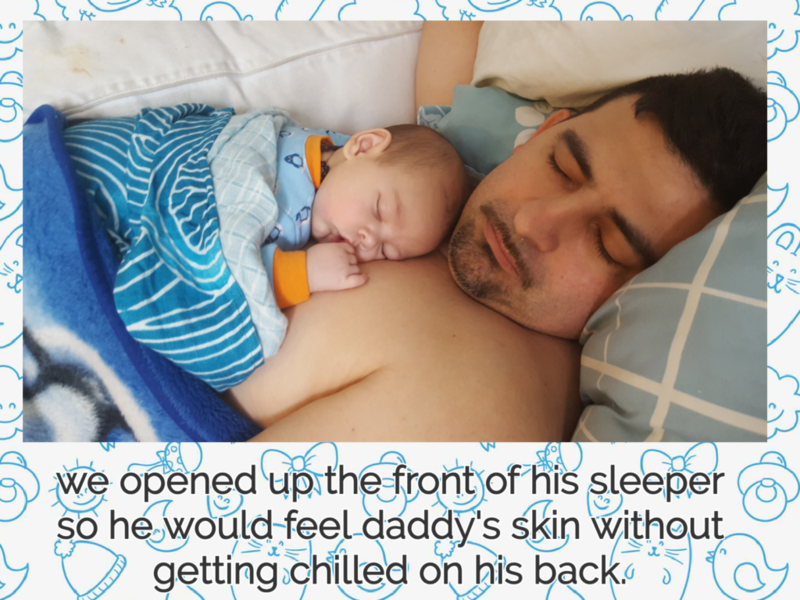 We just opened up the front of his sleeper so he would feel daddy’s skin without getting chilled on his back. My husband jokes all the time that Mexican moms (his own mom included) cure everything with Vaporub. And not surprisingly, the factory where Vicks makes this handy little ointment happens to be in Mexico. “Bah-poh-roob.” Say it. It’s wonderful to say in Spanish and I used to make my husband repeat it all the time. Basically, you apply sparingly on their chest and back, under clothes. But it should be noted that Vicks VapoRub is for ages 2 and up and, they do make a Baby version for ages 3 months plus. A trick I like to use is to put it on their feet with socks overtop. It sounds nuts. It probably is nuts. But it works somehow. If you are concerned you should talk to your doctor or pharmacy about any potential risks of Vaporub. Marching up and down the aisle desperately looking for infant or toddler cold medicine or cough syrup? You aren’t blind. It just isn’t there. Children under 6 are not supposed to have it. But guess what Great Grandma used? Honey! It sooths your throat and has natural antibacterial properties, and anyone over 1 year of age can take it. A teaspoonful in the morning really helps my toddler and he doesn’t refuse it. You can also sneak it into hot lemon water, and as a sugar substitute on Oatmeal. Honey on toast is another toddler favourite and is pretty easy on the tummy. Nasal suction bulbs work great For infant congestion, but what if the mucous is super thick and further back? If that is the case, then drops of saline or breastmilk in their nose really helps to break up the mucous and clear the passageway. 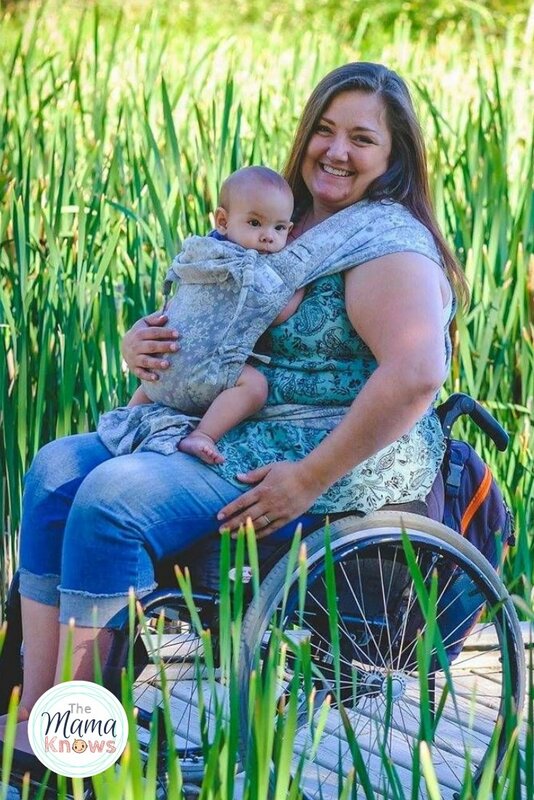 Lay baby on their back with chin gently lifted to tilt the head. Using an eye dropper (I washed out an old infant tylenol dropper), gently squeeze one or two drops of breastmilk (or saline) into each nostril. It will run down their nasal passage and their gag reflex will then send it down their throat. With honey only being recommended for ages 1 and up, that leaves even less options for infants under a year. 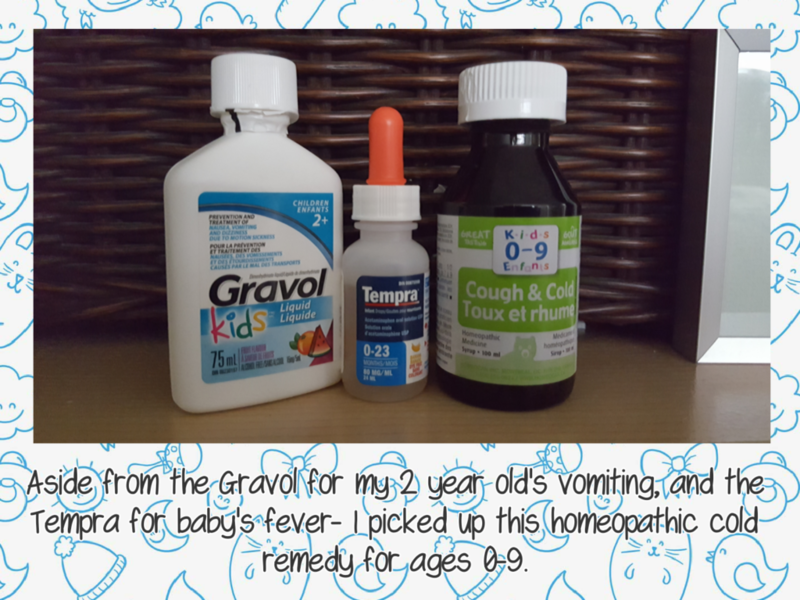 So our pharmacist had recommended the Children’s Gravol for Little’s (2 years old) vomiting, and Tempra for Littlest’s (2.5 months) Fever. But she also showed me this Homeocan Kids 0-9 Cough & Cold Remedy for both kids. It contains homeopathic medicine to help relieve dry cough, congestion, mucus build-up and reduce pain and fever. Finish up with lots of cuddles and you are all set! But remember to trust your gut and head to the professionals if things get serious. It’s always better to be safe than sorry. And any cold or flu symptoms that persist more than 5 days need to be seen by your doctor. None of these suggestions should be taken as medical advice. 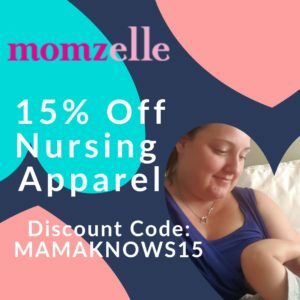 What tips do you have for dealing with cold or flu in babies?